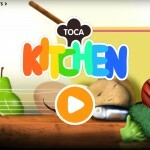 Toca Kitchen is a fun and quirky app that allows the player to be a virtual chef for any one of four hungry diners. Appropriate for all ages, but younger players may need some guidance at first. 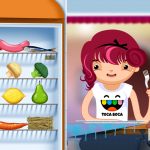 Toca Kitchen is one of several free-play games from Bonnier Digital. As with the other Toca titles, Toca Kitchen has no point scoring system, overstimulating background music, or anxiety-producing time limits. This allows children to prepare and serve food to their hungry customers in a stress-free environment that fosters creativity. The app’s creator even provides parents with a letter explaining the objectives of the game and offers suggestions of questions to ask children as they play. For example, it’s important to point out that while the cat reacts with delight at being served raw fish, the girl turns her nose up in disgust. Upon opening the app, I had a choice to feed one of four characters – a cat, a bull, a girl, or a boy. Swiping the left side of the screen presented me with a well-stocked fridge offering ingredients from steak to lemons to carrots. 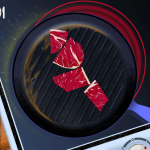 I could then drag the food items to the right side of the screen where I could choose to chop, boil, grill, microwave, or blend the meal in whichever order I liked – the steak can be grilled and then sliced before being served on the plate of a waiting diner. This app is a must-have for the budding gourmand in your house, as it paves the way for you to teach about the culinary process without ever having to boil water or wield a large knife. I also got a lot of feedback when prompted from my highly particular 4-year-old who was not shy about telling me he would never eat anything offered in the Toca Kitchen. There is a version of this app available that allows the player to feed monsters, and let me tell you, monsters may be even more particular than my child. Toca Kitchen, and its Toca Boca brethren, are ideal for the younger demographic that hasn’t quite mastered the concept of time limits or progressive levels of some trickier games out there.